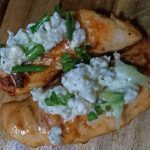 This Buffalo Chicken recipe sure to please all of you blue cheese lovers out there. Rich and delicious! Chicken: Mix the buffalo sauce and mayonnaise in a bowl, place the chicken in the bowl and let marinate for 15-30 minutes. Place the chicken on the grill at medium heat, baste occasionally with the sauce (the mayonnaise helps the hot sauce to cling to the chicken). Grill until chicken is cooked to at least 165F all the way through. Remove from grill and serve with blue cheese mixture. Blue cheese mixture: In a small sauce pan melt the butter on low heat and add the blue cheese, scapes and or scallions. Allow the cheese to soften, not melt all the way. Serve on top of hot chicken - after it's removed from the grill. Burger Option: A delicious alternative is to baste your burger with the hot sauce mixture and top with the blue cheese mixture.